BTW, have you been only catching my updates on Fridays? Well if you don’t already know, I’m trying to complete the rest of Chapter Six in order to release Moose River Book Two in time for the Alternative Press Expo, which is on November 1st and 2nd. This means I’m working extra hard to blitzkrieg pages out! I’ve actually posted two pages earlier in the week, one on Monday and the other Wednesday; if you didn’t catch them, you should certainly see to it! Furthermore you can 101% definitely, absolutely, positively expect new pages to be posted Monday, Wednesday and Friday next week and every week for the next six weeks, seeing as I need to complete twenty-something more pages in less than two months. Tres bien, non? Now I’m just excited with the idea of finishing Book Two and starting work on Chapter Seven. That means my book is now two-thirds of the way finished and that all I need to do is hammer out three more chapters and I’ll finally be finished with this story. 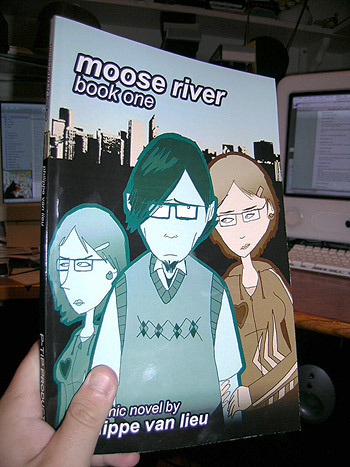 It also makes me wonder if I should make a Book Three once Chapters Seven, Eight and Nine are finished, or by that point just compile everything into a single, 300-ish page “Moose River” graphic novel? I suppose making a Book Three would be fair to those who bought Books One and Two, just so they wouldn’t need to re-buy Chapters One through Six. Though I suppose a Book Three would just be a limited run versus the grand scale release I plan for the final 300-ish page book. Concerning the cover for Book Two, I’m thinking of repeating the whole “Main Character is dreaming a dream about someone while that someone is really there thinking the opposite” thing I did with Emo on the cover of Book One. With that in mind, I was considering using Shea getting her head shaved by a dream Brian (in tan) while the real Brian (in seagreen) is looking in disgust. The only issue with that is that whole thing took place in Chapter Three and is therefore unrelated to Book Two. Maybe instead I could have Shea in her Halloween costume with Dream Danzig-Brian rubbing her short hair while real Danzig-Brian is in the background looking in disgust. Whaddya think? This entry was posted on Friday, September 5th, 2008 at 12:01 am and is filed under Anne, Avery, Chapter 6, Claire, Emo, Evelyn. You can follow any responses to this entry through the RSS 2.0 feed. You can leave a response, or trackback from your own site.